We can take most things! At Any Waste. 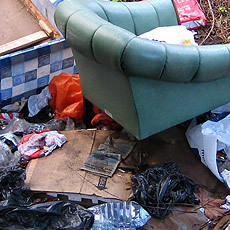 we are the specialists when it comes to clearing your rubbish in a safe, environmentally friendly and secure way. We try not to get in the way and we don’t leave a nasty mess behind after, using our expertise and experience to guarantee that all of your rubbish clearance needs are carried out in a fast and efficient manner and with the bare minimum of fuss. If you still find yourself unsure as to whether or not we can take your rubbish, give our friendly Manchester based rubbish clearance team a call, or you can alternatively contact us using one of the links below and we will be sure to get back to you as soon as possible!